The A-SIG is a 12-week coaching series designed to remove the mystique from becoming an “A” rider. The A-SIG will ground you in strong individual cycling skills, effective group riding practices, and beautiful, efficient pacelines. A smooth and delightful paceline, firing on all cylinders, happens when everyone involved has mastered the individual and group skills required. We acquire these skills only through practice and experience with other riders. For that purpose we bring you the A-SIG. You will spend twelve weeks (one weekend ride plus weekday training rides) learning to paceline in a highly disciplined way—in a way that may even seem exaggerated compared with what you may see in pacelines outside of the program. But by adhering to the program you will learn how to ride in close proximity to others, at speed and with confidence, in a way that will never leave you, whether you continue with Club rides, or go on to race. 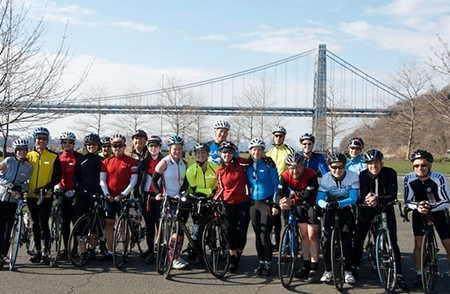 The A-SIG progresses gradually, taking you from a 40-mile spin into New Jersey in early March all the way to a challenging 100-mile “century” ride in mid-May. We’ll climb many of the best-known hills in the area and speed our way down 9W in tight, cooperative pacelines. Along the way, you’ll pick up new bike control skills, climbing and descending techniques, and nutrition tips, all while bringing yourself to peak physical condition. 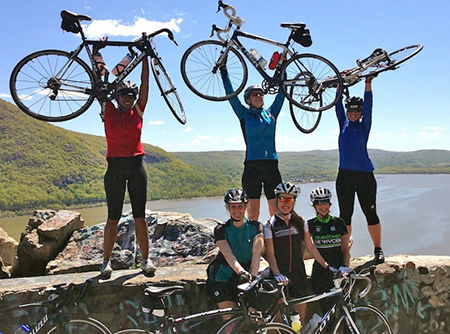 One of our recent graduates called the A-SIG “Bootcamp on a Bike,” and we don’t disagree. But it’s not all serious: You’ll not only come away from the A-SIG with new skills, you’ll make new friends that you’ll ride with for years to come. One of the goals of the A-SIG is uniform/consistent effort, not speed; we teach a very specific style of cooperative group riding with an emphasis on safety, smoothness, and altruism. The A-SIG will challenge you physically and mentally. Although we strive to avoid overextending your limits, the very nature of our curriculum will in all likelihood increase those limits. At the end of the SIG, each participant is expected to give back to the Club and lead at least one official NYCC ride in 2017. The A-SIG requires a large time commitment from each Participant, and we ask that you consider this before registering. However, it’s a time investment that for most people results in the one of the most rewarding experiences they’ve ever had, on or off the bike. THE WEEKEND RIDES—Each weekend ride with your Leaders and fellow Participants will take up a significant portion of your day. Early in the season, when the rides are shorter, you may get home early in the afternoon. However, as the length of the rides increase, we may not get home until the evening. Basically, we own your weekends (because Sundays are our rain-date). WEEKDAY TRAINING—To hone the individual and group skills required to complete the A-SIG, most Participants will need one or two high-intensity training rides (15-20 miles) during the week, with other Participants and A-SIG Leaders whenever possible. We also recommend at least one low-intensity “recovery” ride, especially the day after the long weekend ride. ATTENDANCE—Participants are expected to attend all twelve rides and, whenever possible, the midweek training rides our Leaders offer. 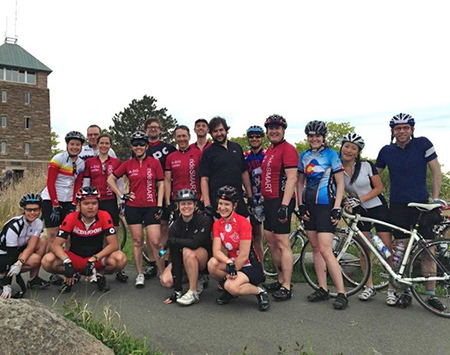 As a progressive series, each week’s ride builds upon the previously taught skills and enables you to manageably increase your physical effort over the course of the program. Participants who miss more than two weekend rides will likely be asked to leave the program (you may return in a subsequent year). Participants who miss two weekend rides in a row will be asked to leave the A-SIG. The A-SIG leaders bring a wealth of cycling knowledge and experience and most are graduates of the A-SIG and/or A-Classic. All Participants are expected to accept coaching and criticism from the Leaders and comply with their directives. Through the entire series, the Leaders will give suggestions on safety, bike fit, bike handling, and training techniques. The Leaders will also make suggestions on organizing and leading Club rides. While you’ll ride with different Leaders every week, every Participant will be assigned a Leader-Mentor to help them get the most out of the A-SIG. Having trouble deciding between the A-SIG and A-SIG Classic? That’s likely because the curriculum and coaching philosophy is quite similar and both are physically demanding experiences. What it comes down to is that the Classic will ultimately push you harder and faster than the A-SIG. Still can’t decide? Do what many do: take the A-SIG this year and the Classic next. If you have other questions, read the FAQ at the top of this page or contact this year’s A-SIG captains, Susan Conova and Bob Ross, at [email protected]. We hope to ride with you this spring! The A-SIG is not a walk (ride) in the park; it is a rigorous training series that teaches a very specific style of cooperative group cycling. You will be coached, you will be critiqued, you will receive feedback on your performance, and you will be graded on your performance. (This is where the “bootcamp” analogy comes in). Not every Participant who registers for the A-SIG will complete it; those Participants who have not acquired the necessary skills to ride safely in a fast paceline by midway through the program will be asked to leave. The A-SIG curriculum and its Leaders will give you the tools to succeed, but success depends on attendance and compliance. For most Participants, the A-SIG is a challenge...but for most graduates it is an incredibly enriching experience, well worth the effort.